Many people associate the Tarot with fortune-telling and supernatural experience, but this is a somewhat limited perspective. Most historians believe that the Tarot first manifested as game-playing cards. 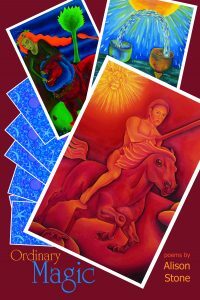 Others view the cards as a study in archetypes and images. As we look through a deck of tarot cards, we can recognize—in the kings and queens, the hermit and devil, the illuminating sun and collapsing tower—images from a life, any life, even our own. The Tarot reveals characters and situations to which most people relate. In Ordinary Magic, Alison Stone celebrates the enduring powers of these tarot images. Stone’s tarot-inspired poems explore a magic, not of a supernatural world, but of this one. The collection begins with a series of poems inspired by the Major Arcana, the suit that illustrates universal themes and archetypes. These poems, which comprise the first section of the book, mediate on archetypes that reveal aspects of the human condition. In this section, Stone’s images literally speak to us as she adopts a persona for each Arcanum. The speaker’s voice appears to transcend directly from the inherent wisdom that exists in the ancient images. For instance, as the poem “The Star” reflects upon the tarot image that evokes hope, joy and illumination, as well as spiritual guidance and connection, Stone speaks to enlighten and inquire. the sharp hills blurred to shadow. I’m featured in so many lullabies? In the luminosity of this tarot image, Stone creates memorable images of her own. The synesthesia adds an aural dimension to the star’s visual brilliance. And throughout this first section, each of the poems exhibits Stone’s innovative, mythic imagery. The section ends with a poem that addresses the last card in the Major Arcana, “The World.” Another auspicious image, the Tarot’s world culminates in fulfillment of a successful cycle, journey, or endeavor. The image of the world speaks to us, not as a place to fear, but one of discovery, exploration, and embracement. fenced by skin and fear. Zero is an egg that holds all numbers. As she illustrates the images in the Major Arcana—with their universal themes—Stone conveys the same message to each reader. However, in the following sections, inspired by the Minor Arcana, her perspective changes—from the universal to the particular. The Minor Arcana, which includes the suits of wands, swords, cups and pentacles, evokes images that pertain to everyday life. Here Stone adopts a more intimate and accessible voice as the speaker communicates from a personal perspective. She no longer speaks from the distant, philosophical viewpoint, but from the perspective of interpreter, someone who assesses the relevance of the image in her own life. As the Minor Arcana illustrates characters, activities, and emotions derived from the everyday, the speaker identifies them through scenes from literature, contemporary culture, and personal life. Stone identifies Steve Jobs as the King of Pentacles, Vivienne Eliot as the Queen of Cups, and her grandmother as the Queen of Swords. In the poem “Rope,” the speaker interprets the Nine of Wands, the Arcanum that portrays a wounded but perseverant and successful warrior. The card often signifies the endurance of a final test before reaching a goal, maintenance of stamina in the face of setbacks, and persistence in spite of danger or adversity. Interestingly, the speaker sees the Nine of Wands in light of a precarious incident at her daughter’s birthday party, as she considers the fate of a child acrobat. My daughter first—it’s her birthday. To earth red-faced and proud. she clears the metal pole . . . Still shaken from witnessing the event, that night, the speaker recalls the event: the skill or luck that prevented disaster, and instead, created a successful outcome. She considers virtues and limits of persistence. Here we can see a familiar scene: a child narrowly escaping accident, a mother contemplating the limits of her protective role in an unpredictable world. Stone’s Minor Arcana poems speak, more frequently, in the personal narrative, where she constructs her poems from the practical nuts and bolts of everyday life. In Ordinary Magic, Stone illustrates the significance of the images we encounter, in the Tarot, in poetry, in memory, and daily life. Stone views magic in the way images transcend and endure, across cultures and generations, uniting us in shared human experience. Marcene Gandolfo’s debut book, Angles of Departure, won a Foreword Reviews’ Book of the Year Award in 2014. 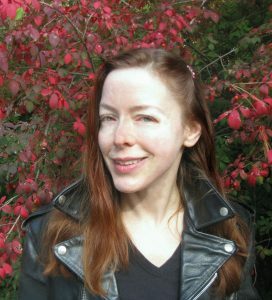 She has taught writing and literature at several northern California colleges and universities, and her work has been published widely in literary journals.